We met at the Zagreb Sheraton Hotel, a group of 18 Australians and 2 New Zealanders, ready to explore and discover Croatia and Slovenia together. Smiles and introductions were followed by dinner, champagne, and converstion with the subject of ‘travel’ high on the agenda. 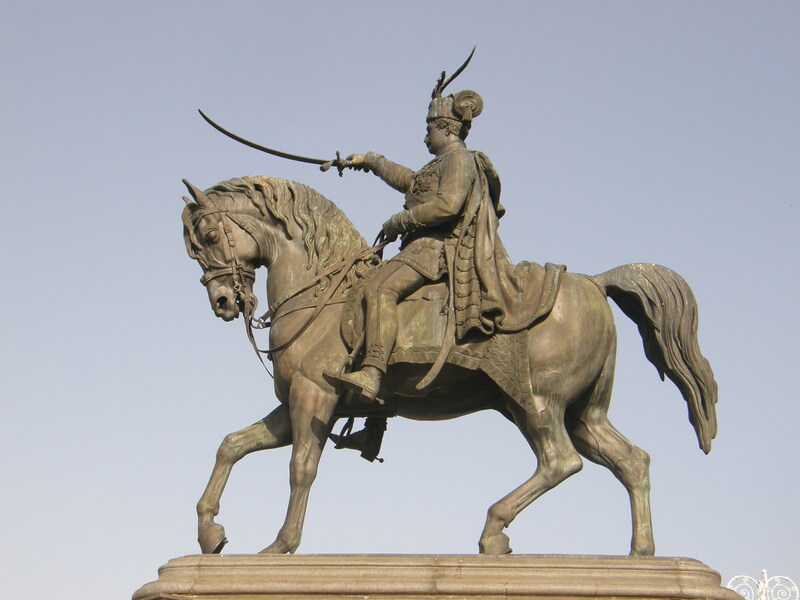 The Croatian capital Zagreb is a gallery lover’s delight. Naive Art, Modern contemporary, Old Master’s, Renaissance, Art and Craft, and the Ivan Mestrovic Atelier are all on my list of favourites. I suggested an evening stroll up to Tkaliceva Street to mingle with the locals after dark..a must do in Zagreb! Two kilometres of boutiques, galleries, and so many al fresco bars and restaurants, where the main pastime is to sit facing the narrow street watching the passers-by and checking out the latest trends, new faces in town, who’s with whom, and who is without whom! 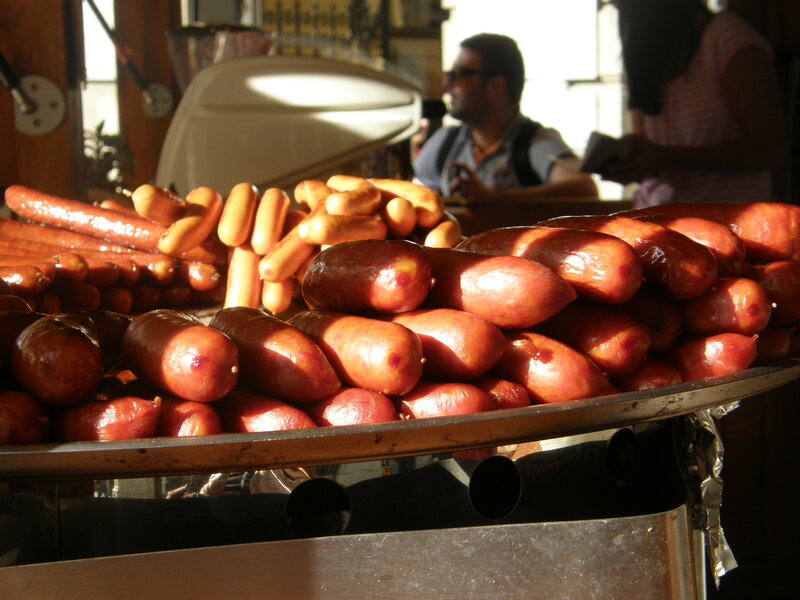 Grabbed a beautiful smoked kobasica sausage …the aroma as we passed by was too hard to resist…wafting under our noses. 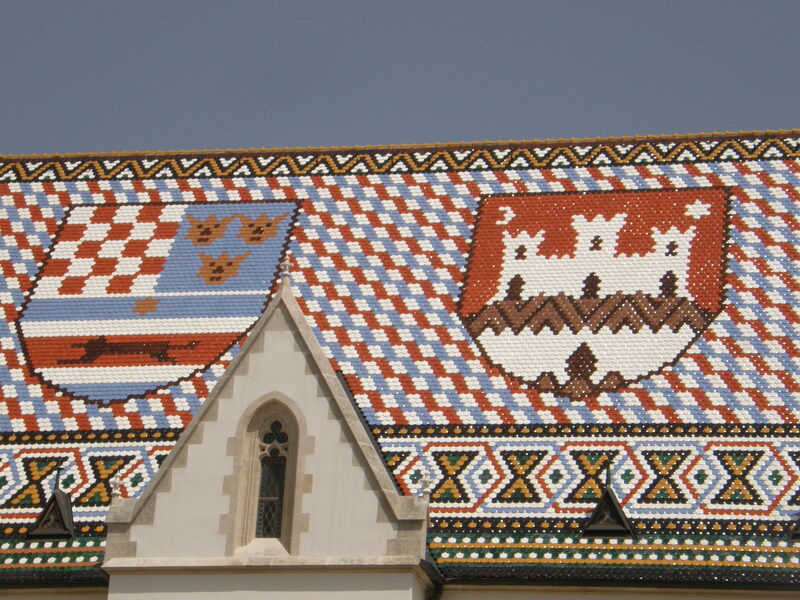 The icon of Zagreb, the colourful tiled roof of St Mark’s Church depicting the symbol of Zagreb on the right, and a shield on the left showing regions of all Croatia. Crossing the nearby border into Slovenia, wending our way up the breathtaking Julian Alps towards Italy; discovering the picturesque beauty of Lake Bled, Postojna Caves, Predjama Castle, (A castle built into a sheer cliff face! ), the sweetheart city of Ljubljana. 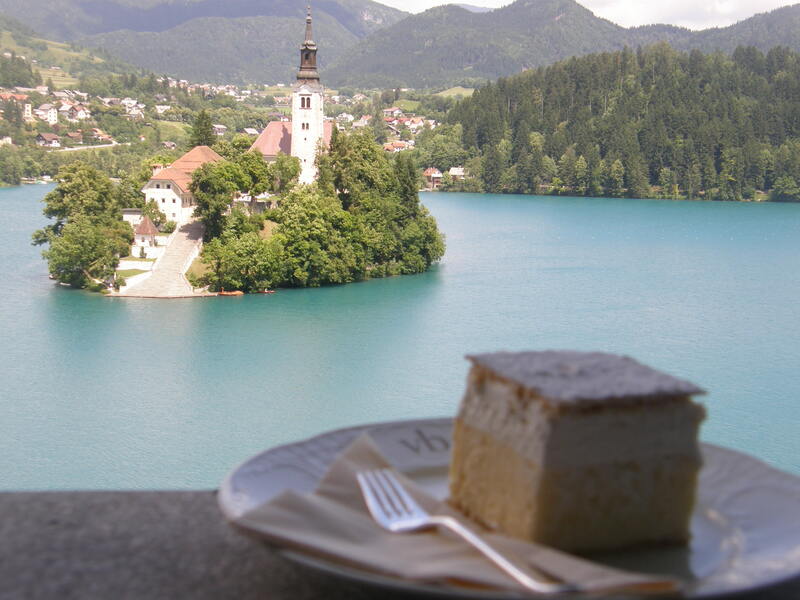 We were rowed out to the little island in the middle of Lake Bled in a timber ‘pletna’ boat, and later indulged in the speciality cake of Slovenia and Croatia, the light as a feather vanilla custardy type cake with equally as light flaky pastry. YUM! Continuing down to Opatija, (playground of the Hapsburgs) on the northern Croatian Coast, across to the Istrian Peninsula, followed by a visit to the stunning Plitvica National Park,where 16 descending lakes of aqua-jade irridescent waters flow and cascade one to the other providing a myriad of photo opportunities. 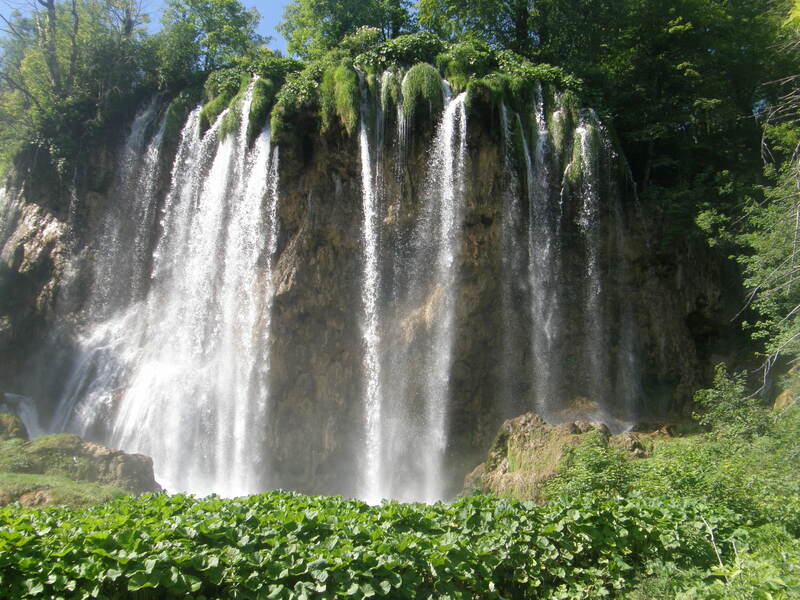 This is one of Croatia’s most popular natural attractions, visited by millions of visitors yearly. 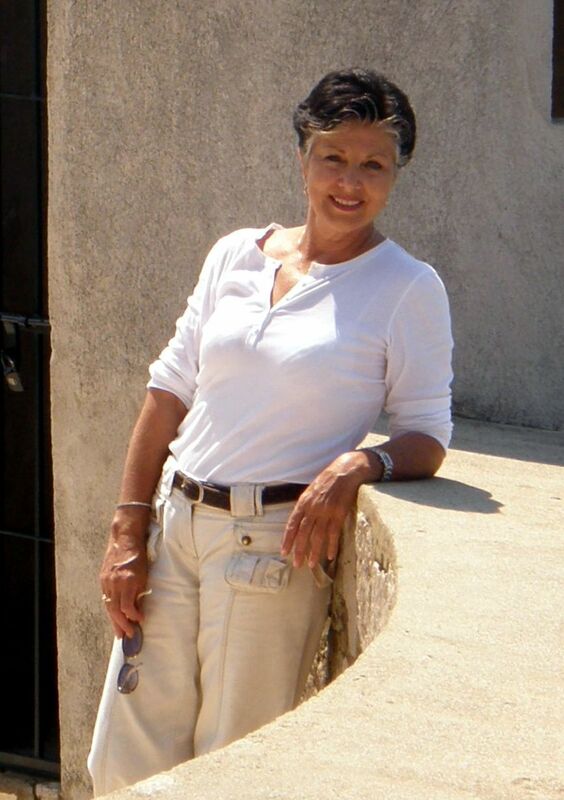 we walked about 7-8 kilometres around the lakes,. 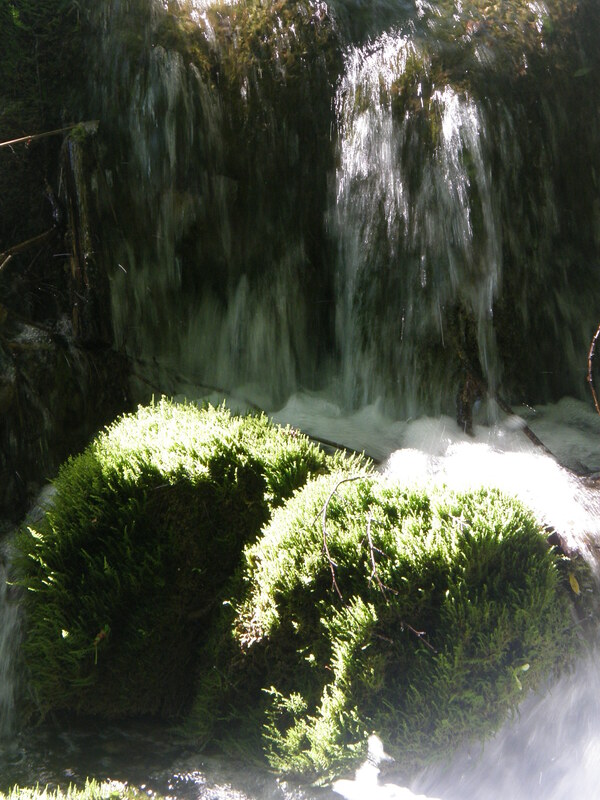 along the pathways and boardwalks with water cascading and flowing above, below and around us from all directions…. Departing Plitvica for the Dalmatian Coast, we stopped in the pretty little town of Skradin on the River Krka. At the Cantinetta Restaurant we savoured some of the fine wines from the nearby Bibich Vineyards at Plastevo and degustation cuisine prepared by Tome Racunica. The Bibich Sommelier, Darko Petkovic, really impressed us with his presentation, convincing us that wine is simply Food of the Gods and is therefore to be enjoyed by all mere mortals….This was definitely a tour highlight…! 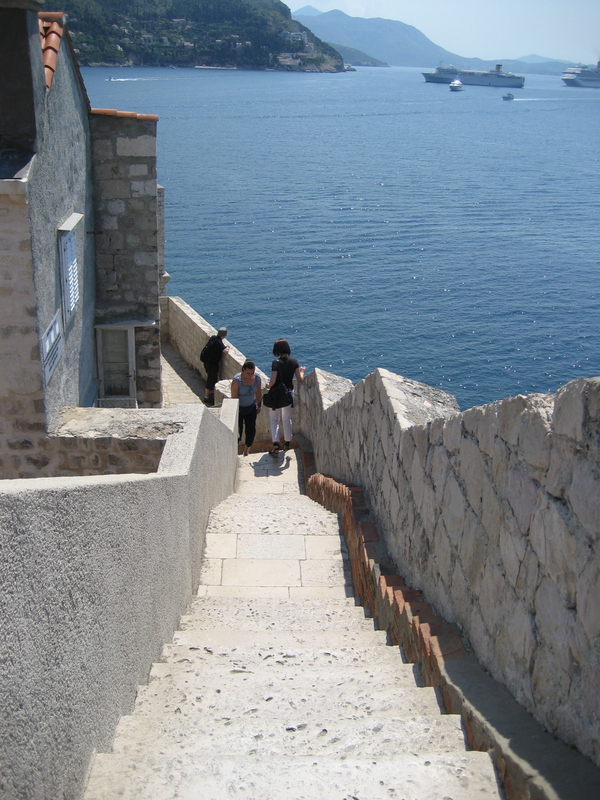 Arriving on the Dalmatian Coast is always a joy…it’s like no other, having a certain rustic, whitewashed look about the landscaape, and the sparkling blue Adriatic is always such a welcoming sight. By this stage the group had truely bonded, and boarding our boat, the M/S EDEN was eagerly awaited. 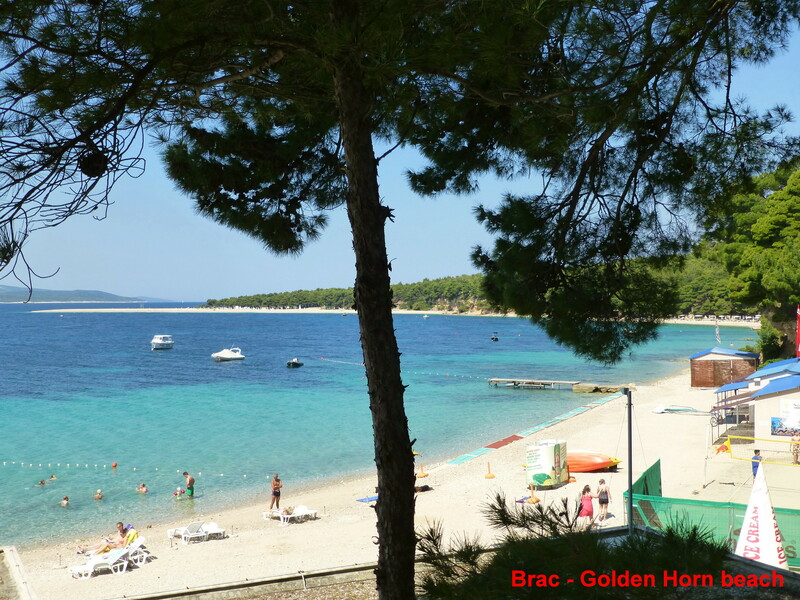 Unpacking for a whole week and taking it easy, sailing through the calm waters of the Adriatic, mooring in some idyllic coves and bays, swimming and sifting through the shopping treasure troves on the islands was a real treat for the girls. 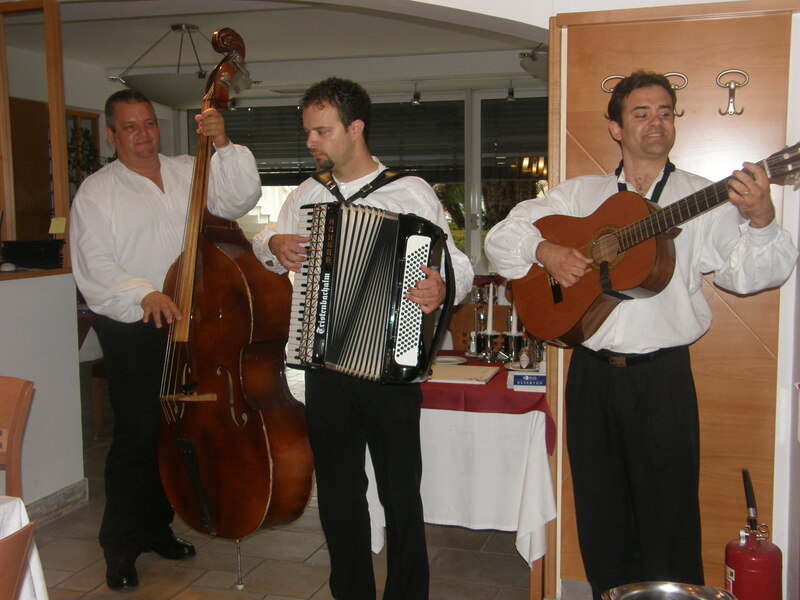 we loved the Dalmatian Klapa music…and if you don’t know what this is…then I suggest you come and find out…it’s music for the soul! 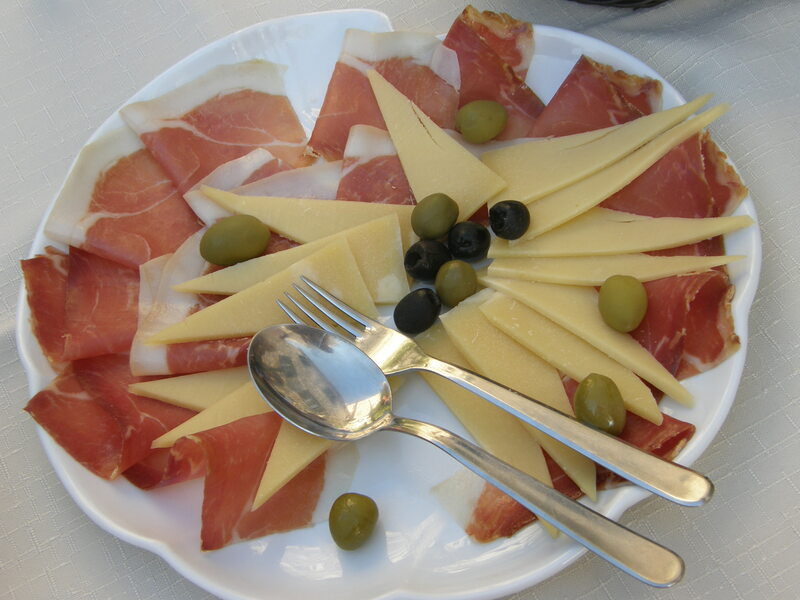 On the Island of Hvar, we went up into the little village of Vristnik and what a lovely meal we had! 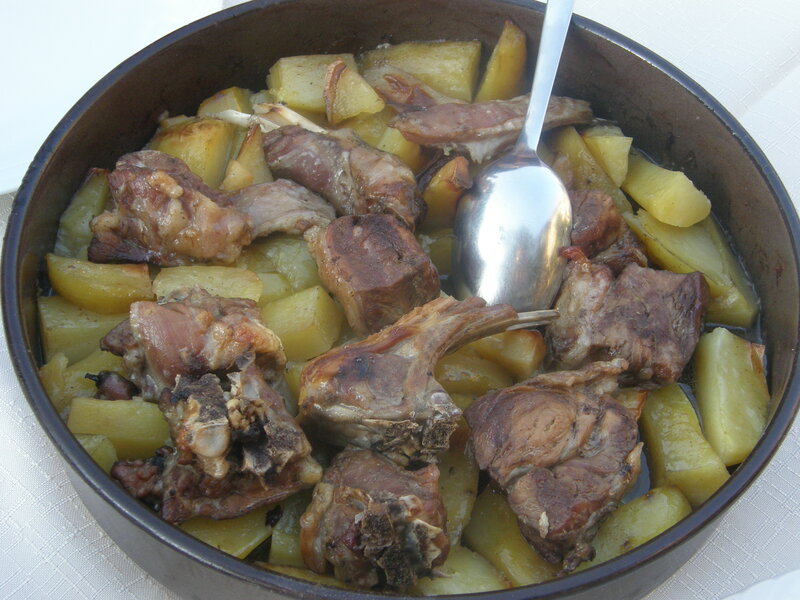 Roast lamb and potatos slowly baked under the coals in the iron Peka Bell…flavours to savour! 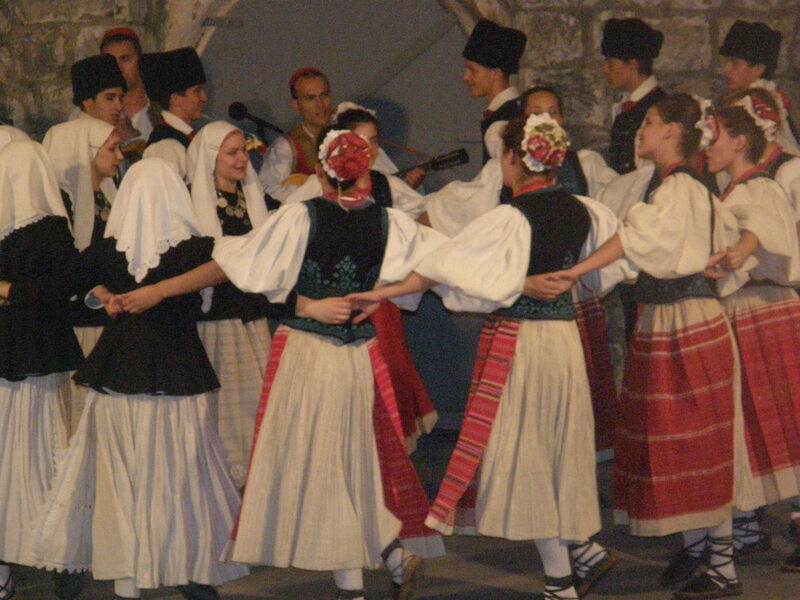 I invited the group to the Lindjo folklore concert, held in Dubrovnik every Monday and Friday evenings…it was a great way to end such a fabulous tour….so colourful and full of passion! It’s always sad to say goodbye, but all agreed to keep in touch, emails were exchanged, and all agreed that Croatia had exceeded all expectations. 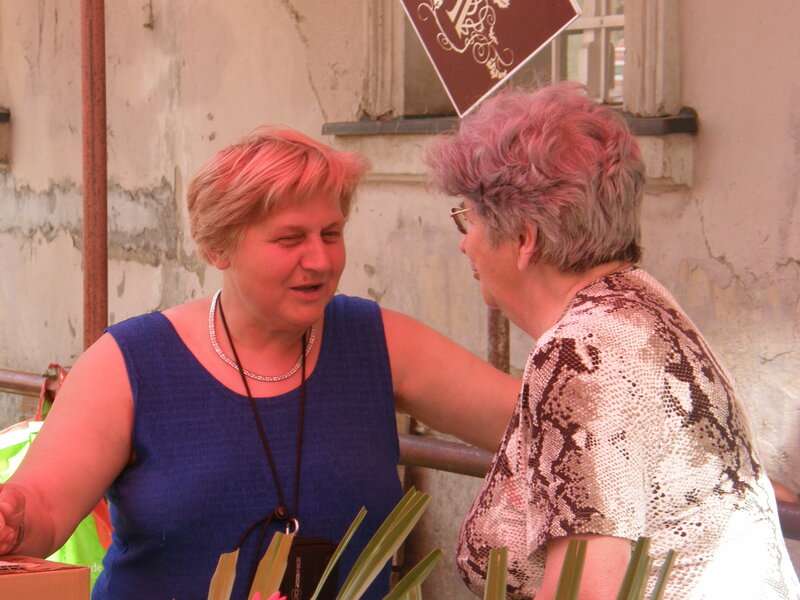 Many vowed to return now that their long perceived ideas, (following many television images of a war-torn dirty-grey coloured ex-communist country) had now been changed to that of a brilliant tapestry of rich colours, smiling people, great food and wines, (and beer!) with so much diversity to offer.